Home News, Press Obtaining a level 3 high environmental Value certification Return to Previous Page. 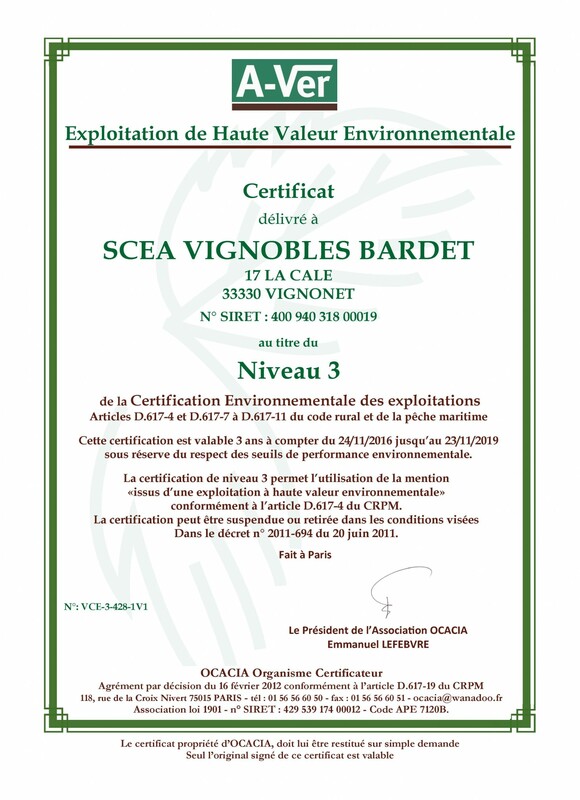 We are proud to have achieved HVE 3 certification, a High Environmental Value farming certificate. and controlled by the French State. The maintenance and development of biodiversity, both within the plots of vines as well as in the surroundings. A good conduct of cultures towards the environment so that useful species can develop, named vine auxiliaries. The latter which very often operate with the greatest discretion, play an important role in the regulation of the vine pest. In the first place, this level environmental requirement corresponds to the respect of good agricultural and environmental conditions. It is checked by a farm advisory body. The operator must also make an evaluation of the farm give a true and fair view according to the second level or in terms of the environmental performance of third level thresholds. Optimize water intake of crops, depending on the water status of the ground and the needs of the plant. The third level certification attests the compliance, of the entire farm, of the environmental performance thresholds on biodiversity, the pest control strategy, fertilization and water resources management, measured either by composite or global indicators. It is an obligation of results.